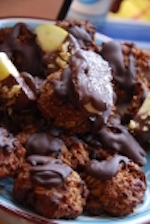 These yummy cookies can be vegan, sugar and gluten free. The recipe makes 12. Combine all dry ingredients. Melt honey in the warm water and add to the dry ingredients along with the oil. Mix well. Drop large tablespoon sized amounts onto the baking tray. Lightly press down with a fork and then cook in oven for 12-15mins. Once cooked, allow cookies to stand on a cooling rack. Meanwhile heat hot water in a saucepan, place a metal or glass bowl over the saucepan and add the chocolate. Allow it to melt but be careful not to burn the chocolate. As the chocolate melts add the soy milk* and stir, creating a thick smooth paste. When cookies are cool lay them out on baking paper and drizzle chocolate syrup over the top and sprinkle with walnut pieces. Refrigerate till chocolate is set. Before serving add the final touch of shredded coconut. Deep Ecology – What is it all about?